A Girl and Her eBooks: Be Mine This Christmas Night by L.A. Sartor Excerpt - $0.99! 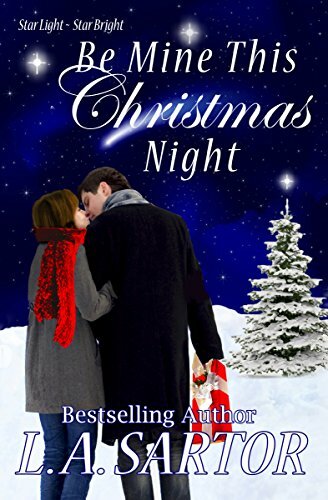 Be Mine This Christmas Night by L.A. Sartor Excerpt - $0.99! Cole Evans is a brilliant scientist, but finds fatherhood a challenge. When his son develops a bond with their enchanting neighbor, the boy’s favorite author, Cole discovers just how much he's lost—and how much he needs. Mannheim Steamroller played through Annie's earbuds from the MP3 player tucked into her parka pocket. What a glorious morning. The storm had moved on, the sky was brilliantly blue, and the sun sparkled off the pristine white blanket that covered everything. Three weeks before Christmas and the snow was a foot deep. The forecasters predicted more this week, so Annie decided it was a sign they'd have a white Christmas. Not rational as that date was too many days away to forecast the weather, but she didn't care. Sometimes you just had to believe. She'd bought the biggest snowblower she could handle, not only because of her wide driveway, but also, once she got going, the whole sidewalk on her side of the street got the Annie treatment. "Jeeze, scare me to death. I'm sorry I didn't see you come up, but I was listening to music." She held one earbud closer to his ears so he could hear the Christmas music. If he didn't believe in Christmas, then she was taunting him, and somehow that didn't bother her a bit. Not her normal behavior, but the guy just seemed to push her ornery buttons. "You don't have to clear our walk. I was going to do it when I came out to clean off the Pilot before I headed for the lab." "I don't mind—it's good exercise so I can make myself a mocha peppermint coffee topped with whipped cream afterward. What kind of doctor are you that you have a lab?" Annie's jaw dropped, then she laughed to cover her own astonishment as well as her embarrassment. "Not an MD, then. My mistake." "Not in a million years. I faint at the sight of blood and anyone will tell you I've got no bedside manner." "You got that right," she murmured under her breath. "Nothing. Really, I plow the neighbor's walks all the time and it's fun, honest," she said, seeing his skeptical gaze. "You have snow in Virginia, don't you?" "Of course. The wet slushy kind." "So you had to remove that, right?" "Except you're doing my sidewalk." "I'm a simple author who does sidewalks on the side, okay?" He snorted and she loved that he would do so. It was such a plebeian thing to do. Not at all "East Coast." "Not a simple author. As you may have guessed, Josh loves your books. And having you live next door may be a curse to you." "It's evident in your writing." Not quite believing her ears, she stared at the man standing in front of her. "Why I do believe that's a compliment, which, before you can retract, I'll take," she added swiftly, seeing his mouth open, then shut. "What are Josh and his brother doing this afternoon? I've got a new character to illustrate and I'd love their input." "Mitch is taking them Christmas tree shopping, then onto snow shoeing lessons this afternoon." "Oh. Well that sounds like fun. Who is—"
Annie glanced up as Cole's front door opened. And when did you start thinking of him as Cole instead of Doctor Cole Evans? "Annie, we're going Christmas tree shopping. Want to come?" "Want to introduce me to your brother and friend?" Annie nodded to the man and boy who now stood next to Cole. "Oh. That's Uncle Mitch. And that," he said, pointing to the youngest in the trio of males standing together, "is my brother, Peter." Peter stood unmoving and unsmiling until "Uncle Mitch" nudged him. Not Cole, Annie realized, but Mitch. Curious. Peter looked at Mitch, then at her. "Ah, nice to meet you." Annie smiled at Peter and held out her hand to Mitch. "And nice to meet you both as well. It's great Cole has a brother nearby." Ah. More curious. "My mistake." It was evident by Mitch's clipped tones he didn't like her. He didn't know her at all, but he sure didn't like her already. And that she wasn't invited to their outing was also pretty darn clear. Hi Amy, Merry Christmas from Colorado. Both in my books and in real life. Wish we had snow, but none to speak of. In fact it was 64 degrees today. Thanks for posting this. This was my first bestseller. #1 on Amazon. WOW.